SustainableWork: USDA: ‘Locally grown’ food is a $4.8 billion business. USDA: ‘Locally grown’ food is a $4.8 billion business. "Look, this market is bigger than you thought." The USDA just released a new report on the economic impact of local foods. This report estimates the total amount of local food sales is about $5 billion per year and growing. This report deals with sales of fresh produce sold at farm markets and through regional fresh market channels (local retail, restaurant, and regional distribution outlets). Within this market, there is a much bigger opportunity just beginning to emerge: professional food processing services. At the Wisconsin Innovation Kitchen we utilize fresh local and regional produce to help our customers create new specialty foods and ingredients. We provide professional food processing services to our customers, creating value added products in small batches. In our case, we are also privileged to help create good local jobs for people with very difficult employment options. The specialty food market in the U.S. is about $63 billion per year. When you combine 'local/regional' (about $5 billion and growing) and year-round sales of specialty foods (about $63 billion and growing), there is a tremendous opportunity emerging. My startup pals would call this a very deep blue ocean. Take for instance our friends at Alsum Produce. 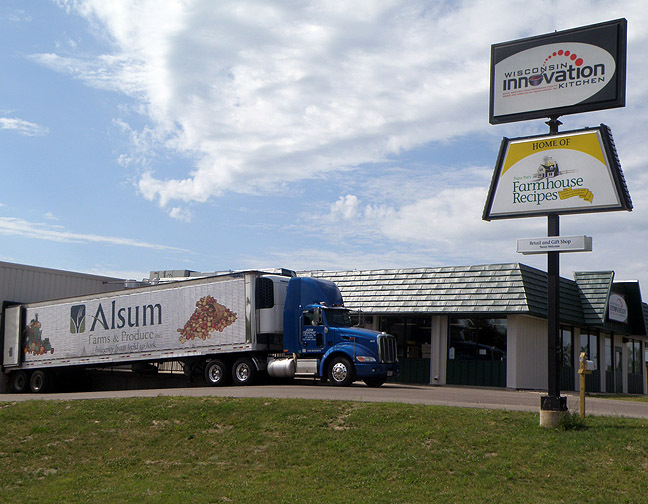 Alsum grows potatoes and onions in Iowa County Wisconsin, and near Friesland, mid-state, where their packing house is located. Photo above is Alsum Produce delivering fresh produce from our region to the Innovation Kitchen. According to the article Alsum Produce has built a $50 million business in this market. The Innovation Kitchen partners with many great suppliers such as Alsum, to source local foods that can then be turned into high quality food products that can be sold year-round. "A new U.S. Department of Agriculture report says sales of 'local foods,’ whether sold direct to consumers at farmers markets or through intermediaries such as grocers or restaurants, amounted to $4.8 billion in 2008. That’s a number several times greater than earlier estimates, and the department predicts locally grown foods will generate $7 billion in sales this year." "There’s real demand in the market for people wanting to know where their food is coming from, that it’s going through local channels." "On his 1,800 acres near Friesland, Wis., Larry Alsum, 58, grows several varieties of potatoes that he sells mostly to grocers in Wisconsin, Illinois and Indiana. He also handles wholesale distribution for farmers who grow everything from cabbage to sweet corn, squash, cucumbers and peppers." "He says his operation has blossomed into a $50 million business — roughly double what it was a decade or so ago — with a focus on locally grown food. Perhaps only one in five consumers actually cares what that means, he said, but it’s more than did just a few years ago." “'As the cost of oil and gasoline continue to rise, there are going to me more opportunities for locally grown,’ he predicted. 'And that just gives us a built-in advantage in marketing.’"
Indeed. Thanks to our friends at Alsum Produce, and all the great producers and distribution companies that are working hard to make new models of local and regional food systems successful! Full story at Boston.com, the Boston Globe online. USDA full report. PDF format. 3.6 MB. 35 pages. Alsum Produce. From field to fork, Alsum Farms & Produce is responsible for growing, sourcing, packing and delivering the highest quality fresh fruits and veggies to your grocery store. We grow eco-friendly Russet, Red, White, Golden and Purple Healthy Grown® Wisconsin potatoes in the Lower Wisconsin River Valley. And we partner with family farms around the nation to provide you with over 300 quality fruits and vegetables every day of the year. Hodan Center, Mineral Point, WI. Iowa County Area Economic Development Come Grow With Us! Hypercard. Data mastery is very personal.